Cecilia Hae-Jin Lee is an author of several books on food and travel, a producer, a photographer, an art director, and a conceptual artist. She is a restaurant reviewer, regular contributor and photographer for the Los Angeles Times’ Daily Dish. 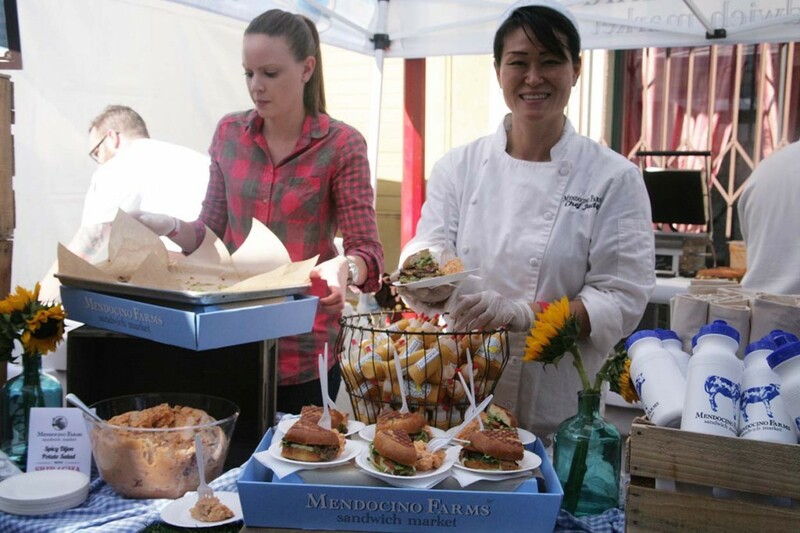 A James Beard Award-nominee, her work has been seen in such places as Google, KLM Airlines, ABC Television, MGM Studios, the Washington Post, Frommer’s, Food + Wine, Eating Well, Eater, Vice, Serious Eats, and a variety of other venues and publications. Her books have been chosen as the Best of the Best by Food and Wine, nominated for a Gourmand World Cookbook award, and was an official selection of Gourmet magazine. She is available for your writing, photographing, producing or editing needs. Calling All Chefs and Korean Food Lovers! 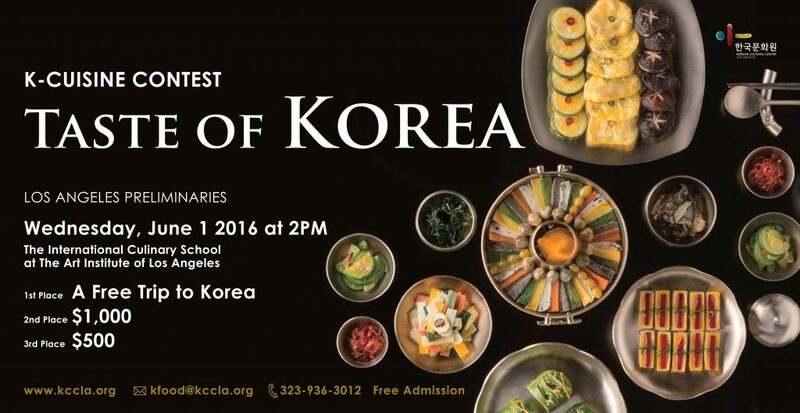 I will be judging a Korean cuisine cooking contest on June 1st run by the Korean Cultural Center of Los Angeles. 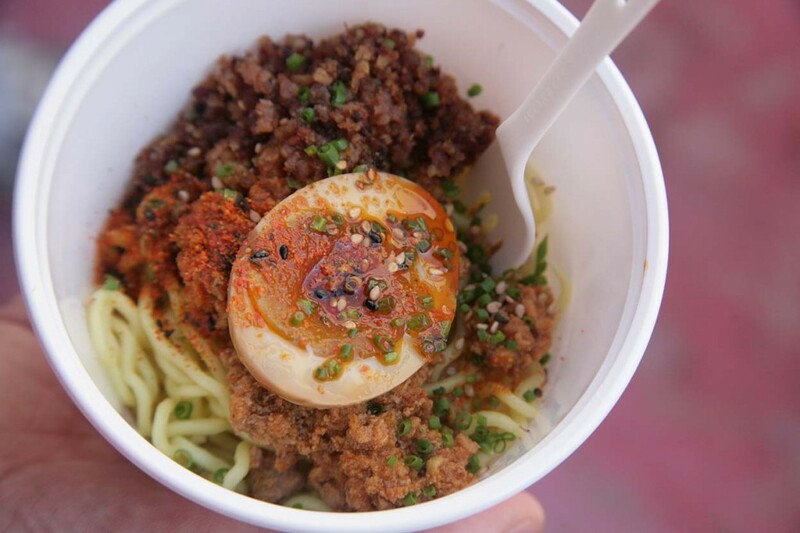 It’s open to non-Korean chefs in or near Los Angeles. The 1st place prize is an all expenses-paid trip to Korea. 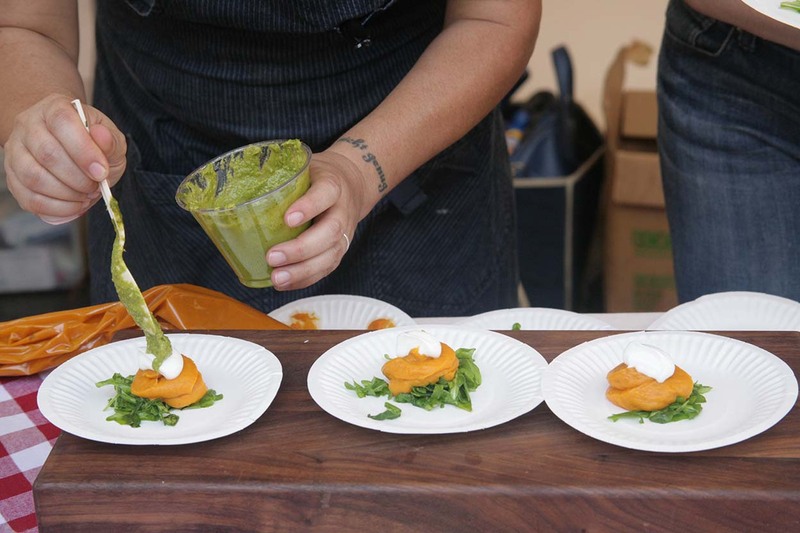 There, you’ll compete with chefs from 20 other countries for the grand prize of $10,000! 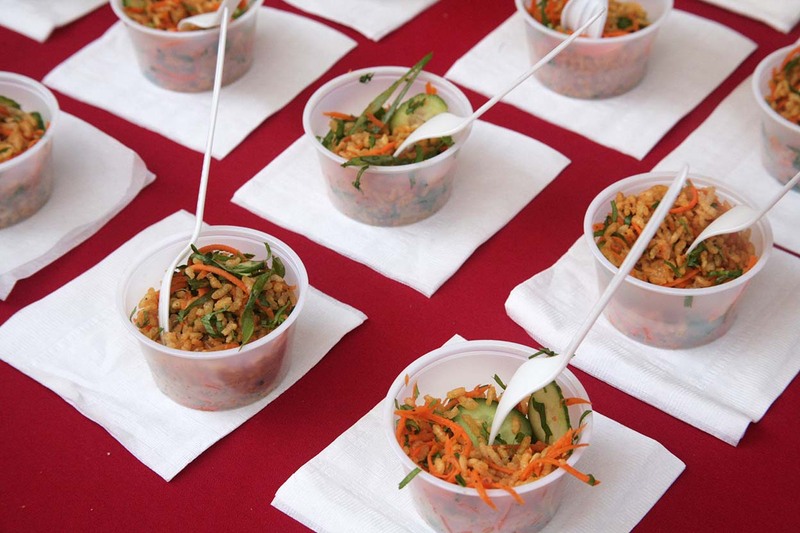 This is a challenge that will truly test skilled chefs of all cultural backgrounds in their ability to create a delicious appetizer and entree using Korean ingredients. Please apply soon at the KCC website or call 323-936-3012 for details. I’ll be doing a signing of my Korean and Mexican cookbooks at The Last Bookstore booth at Artisanal LA on Sunday, April 26th at 2 pm. Stop by and say hello! I’ll have something tasty to share! 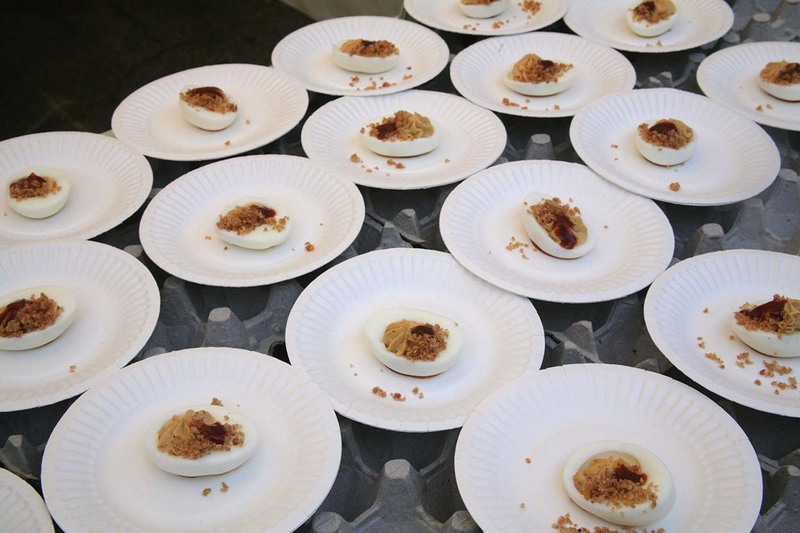 The Winter Fancy Food Show is one of the most exciting and interesting conventions in the gourmet food industry. It’s only shadowed by its larger big sister Summer Fancy Food Show held in NYC every year. I was lucky enough to attend again this year and visit the thousands of exhibiting food producers at San Francisco’s Moscone Center. I met some great people, tasted some innovative products, and got to see where the food industry was headed for 2015. Here are some of the trends and interesting products I saw. 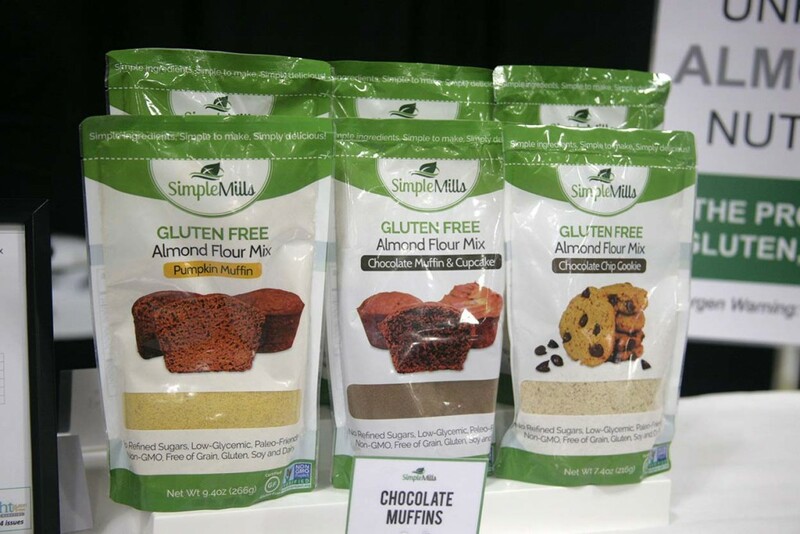 The wave of gluten free products is still going strong. Another big trend were organic and non-gmo products, as well. 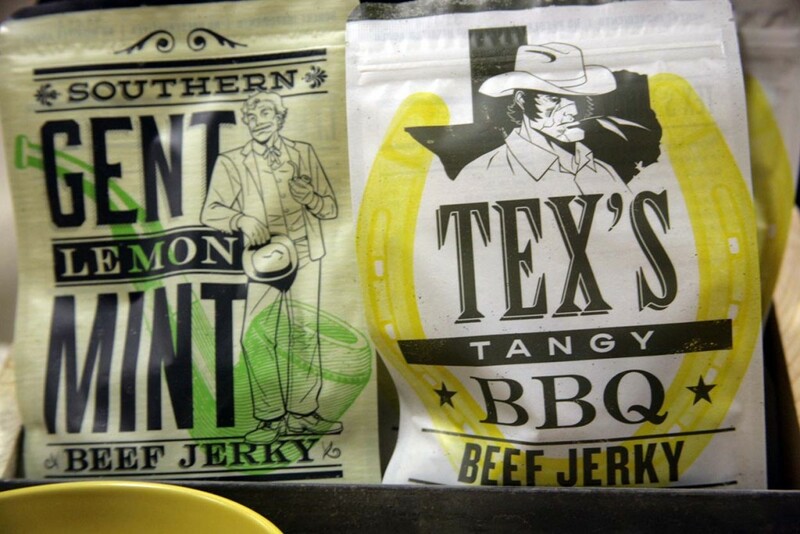 There was also a slew of artisan jerky producers, including Uncle Andy’s who had some fun packages and flavors. 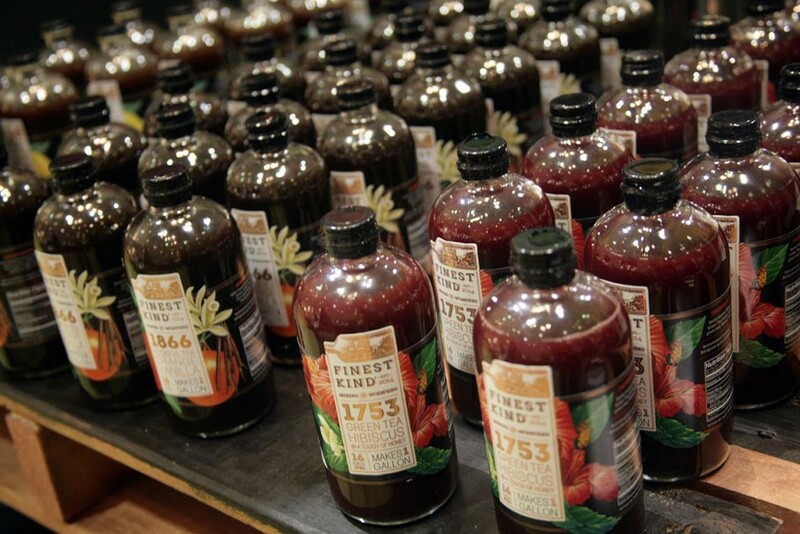 Last year was marked by a wave of aloe beverages. 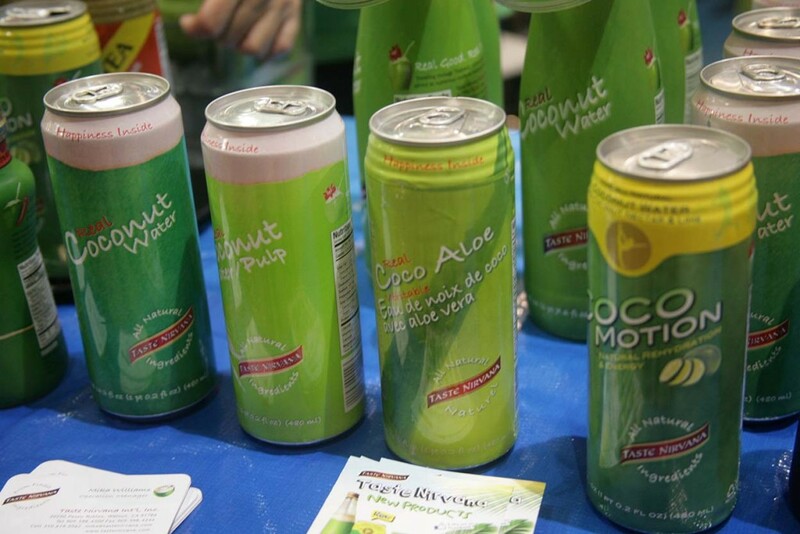 This year was a lot of coconut water (and coco aloe drinks), like the selections from Taste Nirvana. Another trend among food producers was the addition of smoke flavors, liquid smoke or just plain smoking the product, like the smoked olive oil and sugars from Californian producers, The Smoked Olive. 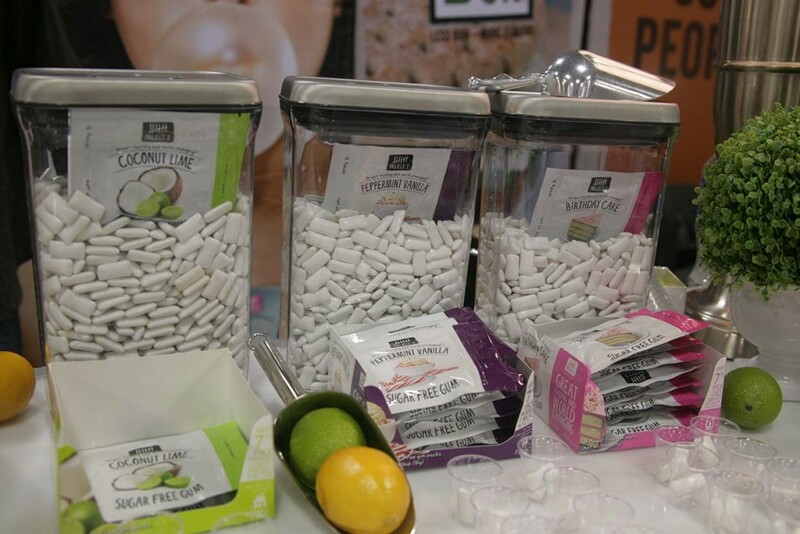 Some of the great new fun flavors were the innovative, sugar-free gums from Project 7. Birthday Cake gum, anyone? 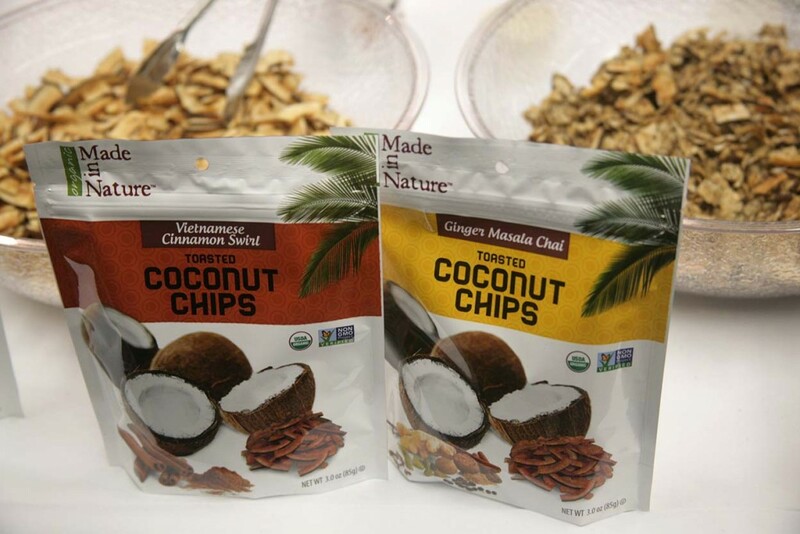 There were several producers making snacks and other things from toasted coconut chips. 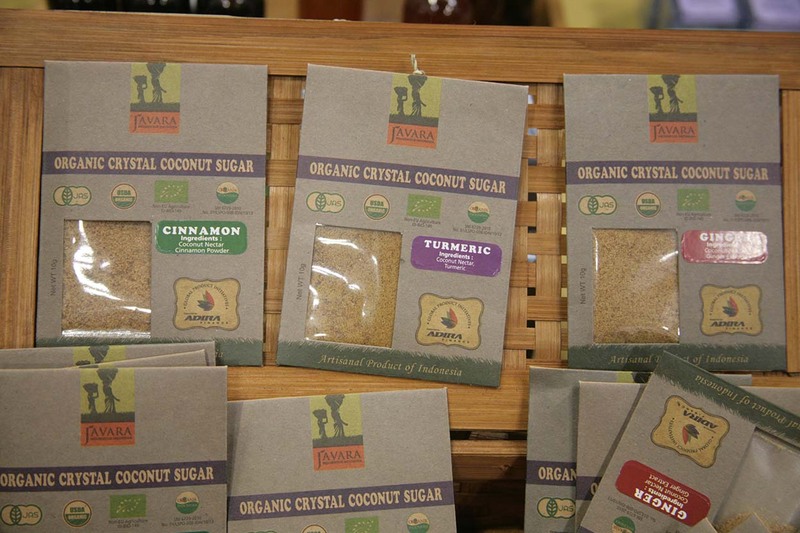 Made in Nature had some interesting flavors like the Vietnamese cinnamon swirl, maple Madagasgar vanilla and ginger masala chai. 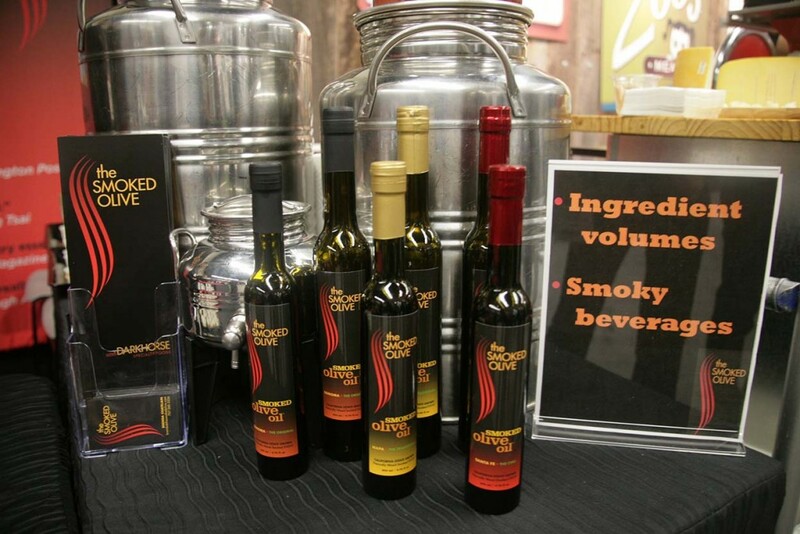 Another category of products that were prevalent this year were the various cocktail syrups and beverage mixes. Look at the beautiful labels on these tea mixers from Finest Kind. 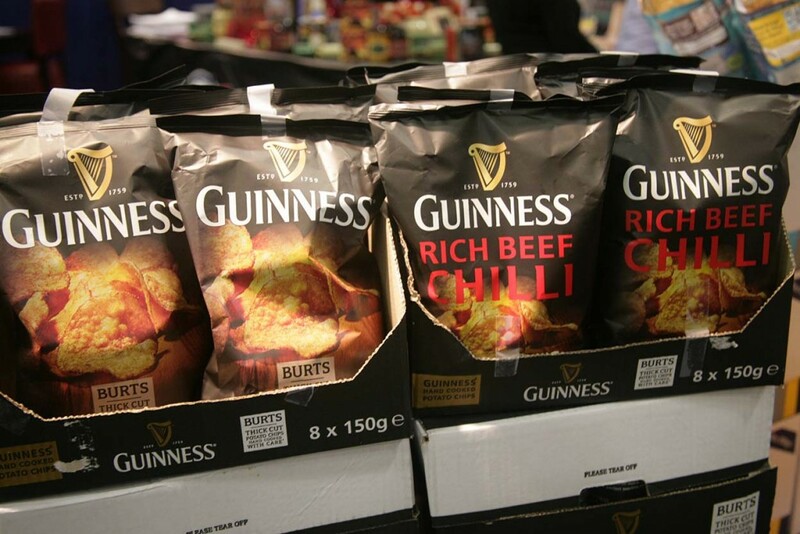 Food mash-ups are always fun, like these Guinness flavored thick-cut, hand-cooked potato chips from Burt’s. 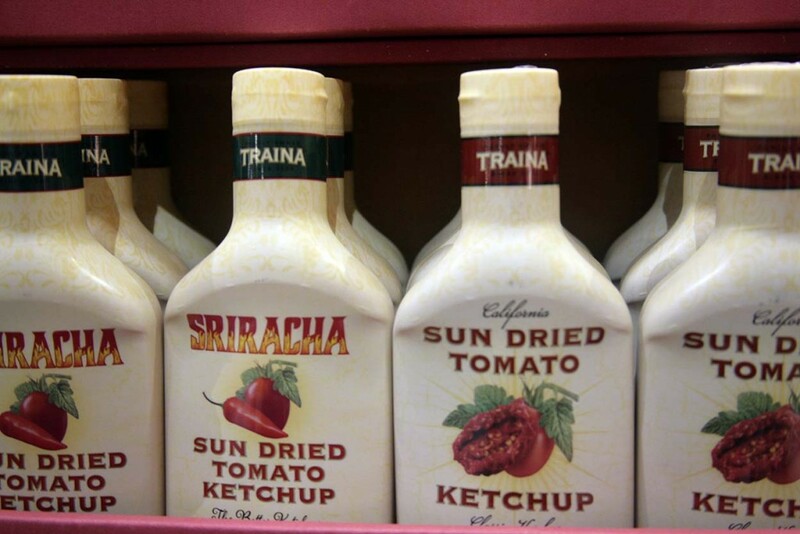 Ketchup is already one of the world’s favorite condiments, but Traina took is up a notch not only by making it with sun-dried tomatoes, but by adding Sriracha. It was a burst of flavor, but not too spicy. 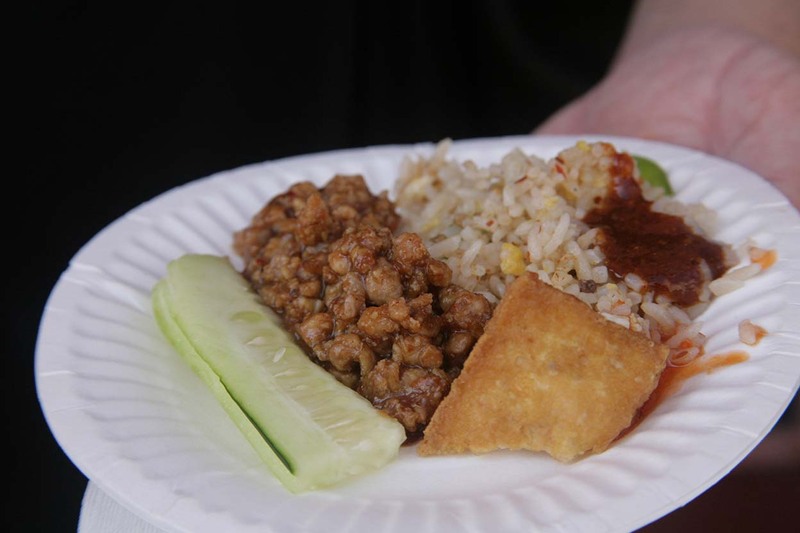 I was happy to see a selection of food products from Indonesia for the first time. They haven’t yet started importing to the United States, but I hope they do soon. 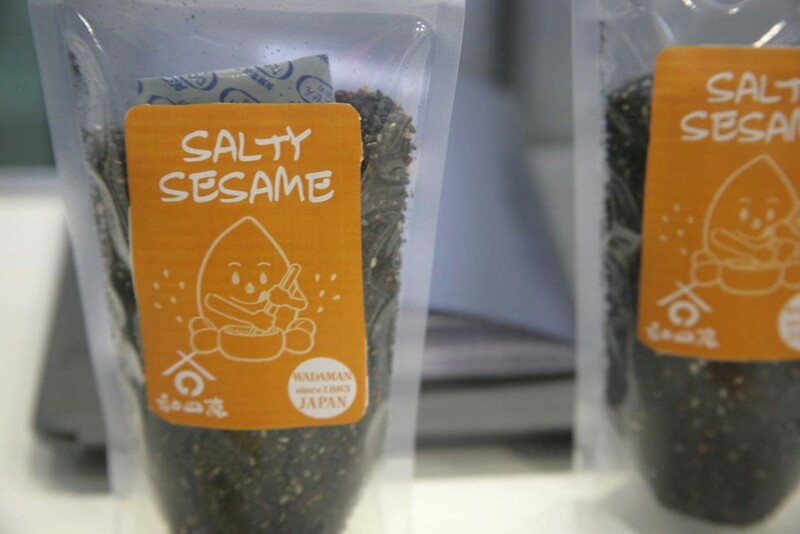 Another product that hasn’t quite made it to our shores yet were these salty black sesame seeds from Japan. It was delicious on just plain old vanilla ice cream, but would be great on rice or as a finishing condiment for a lot of Asian dishes. 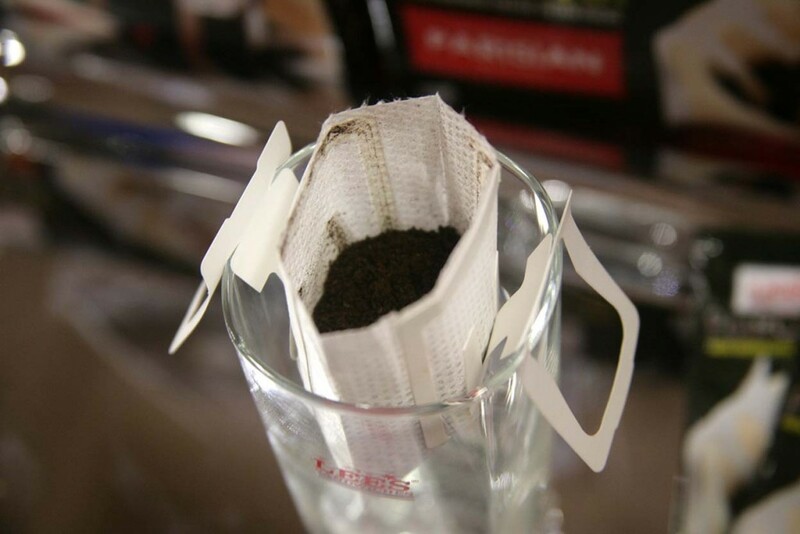 Lee’s Coffees, a Vietnamese coffee company, had a portable pour-over coffee package, which looked like it would be great for road trips and backpacking. 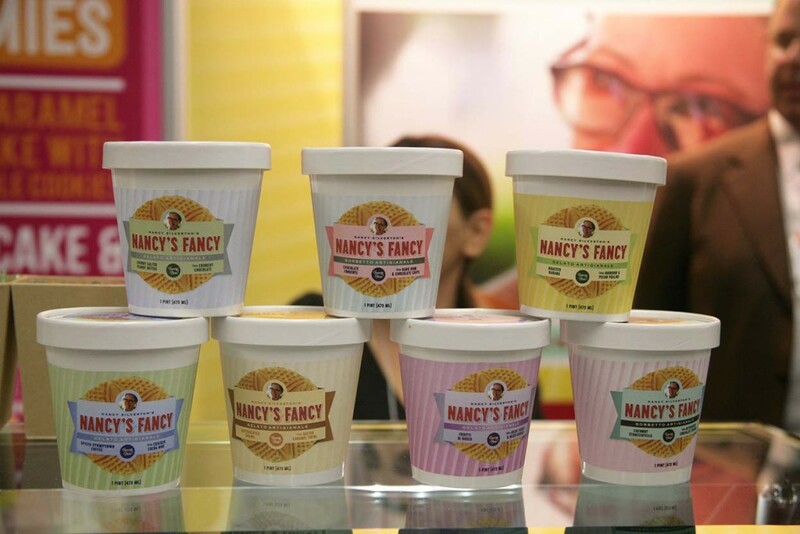 I stopped by Nancy Silverton’s booth to try her new line of gelatos and sorbetto’s. If you’ve ever had the gelato pie at Pizzeria Mozza, you’ll know why the frozen concoction will be popular. 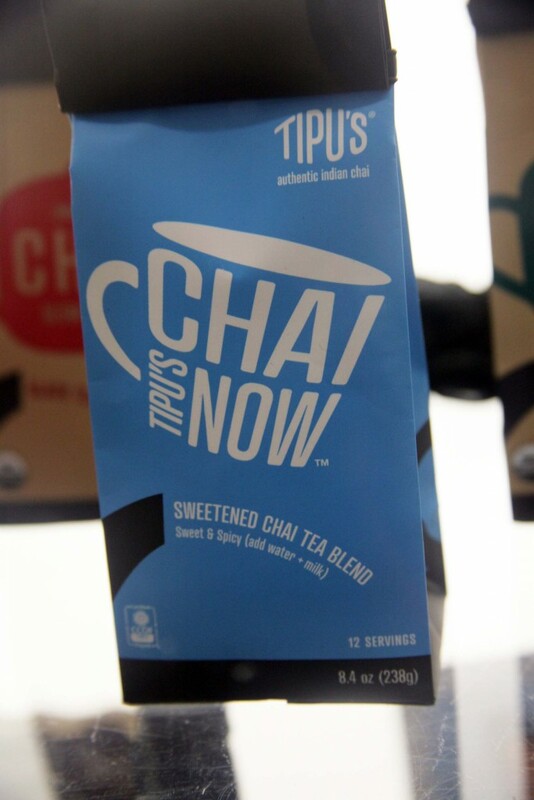 There were some interesting new products and some nicely designed packages and logos, like this fun chai package from Tipu’s. 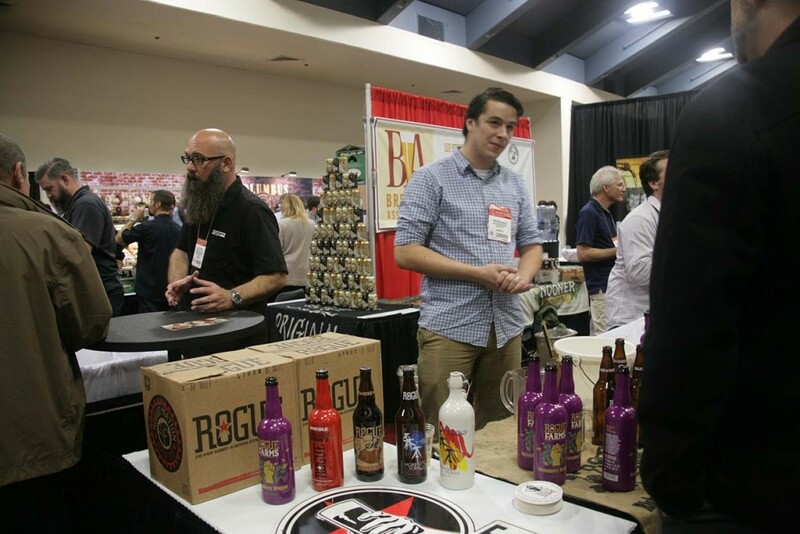 It should be no surprise that one of the most popular areas of the show was the Brewers Association, a group for craft beer makers. How Much Do You Love Sriracha? In my work, I am sometimes asked to eat lots and lots of food. This past Sunday, it was Sriracha, Sriracha and more Sriracha. For good, bad and spicy, I drank Sriracha sodas, and ate spicy red sauce mixed in with apples in a crumble pie, had a subtle Sriracha caramel sauce over ice cream, slurped bacon Sriracha ramen, and much more. 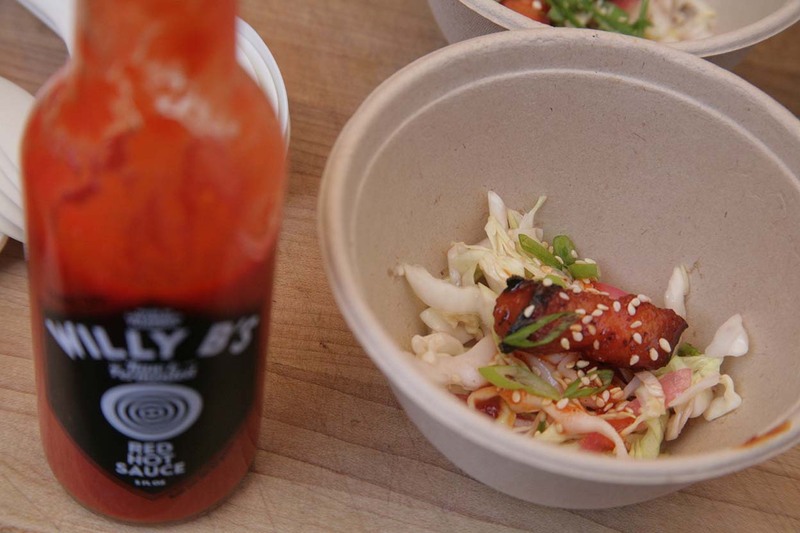 As a professional, I had to drink and eat something from each and every booth at the Second Annual Sriracha Festival. 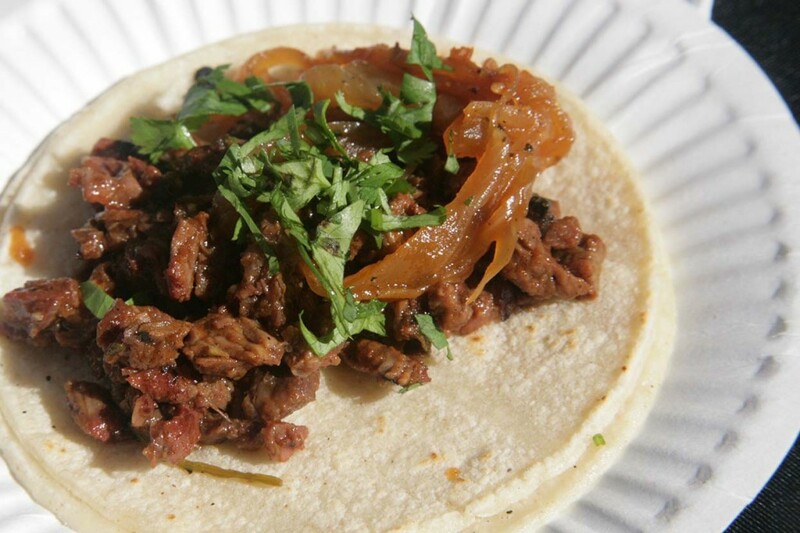 You can see my eating adventure and coverage for the LA Times Daily Dish here. Here are some pictures that didn’t make it to the LA Times blog. I ended up taking way more pictures than ended up being published, as usual. Jitlada’s Thai spicy was so spicy, that my mouth was on fire, and I was sweating for a little while afterwards. 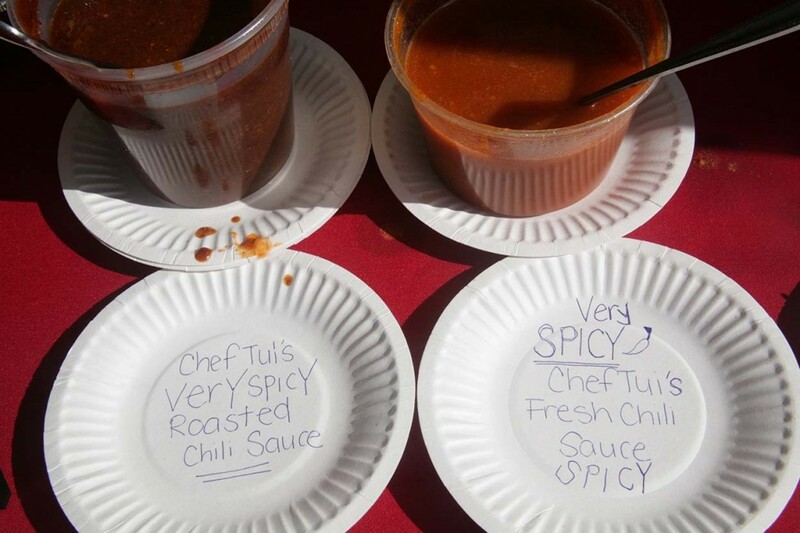 Chef Tui’s sauces were so spicy, that they had to warn you that they were very spicy twice. But, oh the flavor! Komodo’s chimichurri meat was grilled right there over open flames ans served with caramelized onions and chopped cilantro. Sqirl’s crispy rice salad had a satisfying crunch with plenty of crisp vegetables. 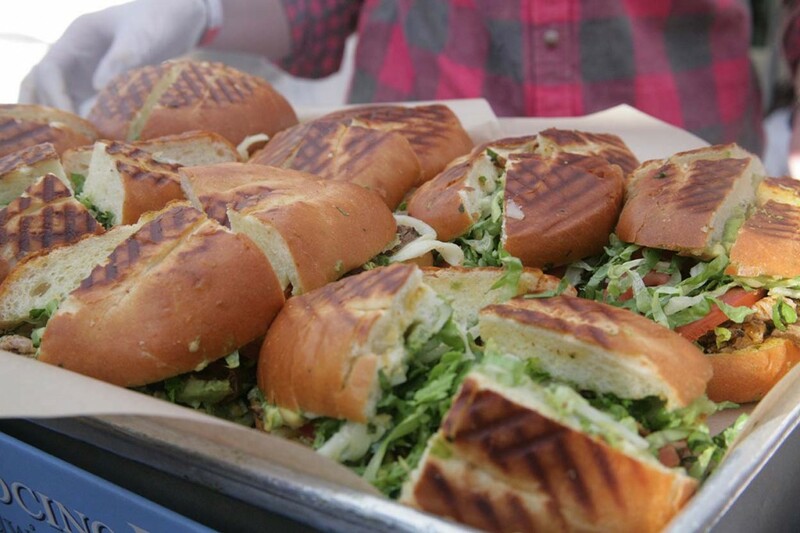 They served generous portions of their chimichurri sandwich and their Sriracha red potato salad. The Mud Hen Tavern in my neighborhood served up a pumpkin puree salad with a yogurt sauce and a green Sriracha sauce with a lot of lemongrass flavor. Will B’s crispy pork belly had a satisfying crunch and a different level of spice from their hot sauce. 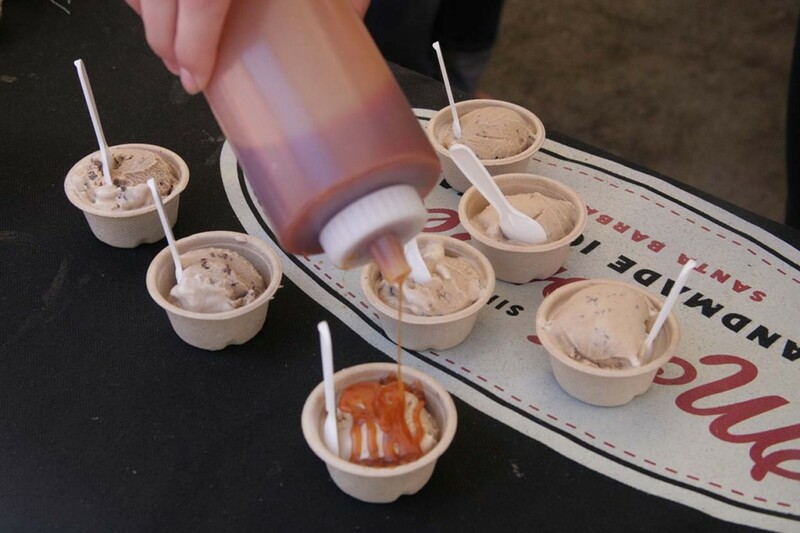 Small bites of McConnell’s ice cream topped with a Sriracha caramel sauce was the perfect thing to end the festival and my Sriracha eating adventure. The pleasure and danger of being a food writer is that friends call you when they have too much food. This weekend, my friends Ron and Carla said they were cutting their grape arbor. Would I like some grapes? Of course, I said YES! When I got there, there were nearly 4 large bins full. I took one, but then, they convinced me to take two. This is what they looked like even after my mom took 4 large bags of grapes. I didn’t know what a ridiculous undertaking it would be. 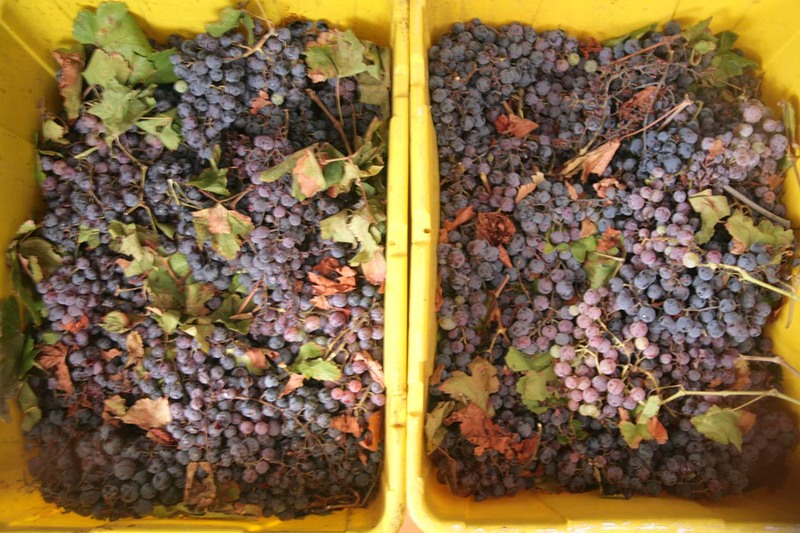 It took me two whole days to clean, wash, de-stem and process the grapes. 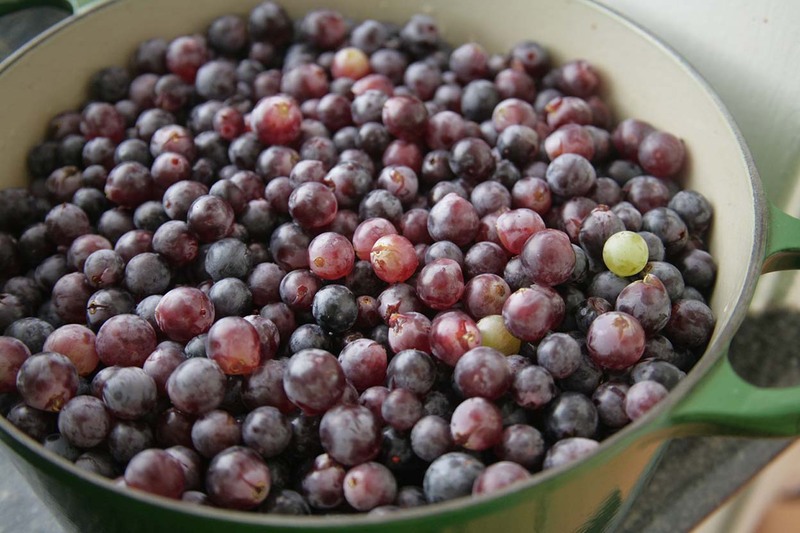 Here is a giant bowl of ripe grapes that my husband washed and de-stemmed for me. 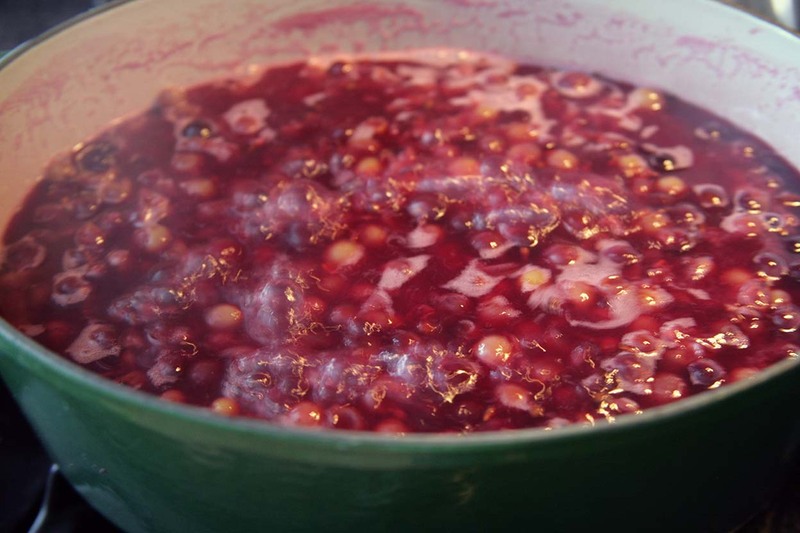 I put them in a couple of my LeCreuset pots to boil down to make jelly. I ended up doing 4 batches! 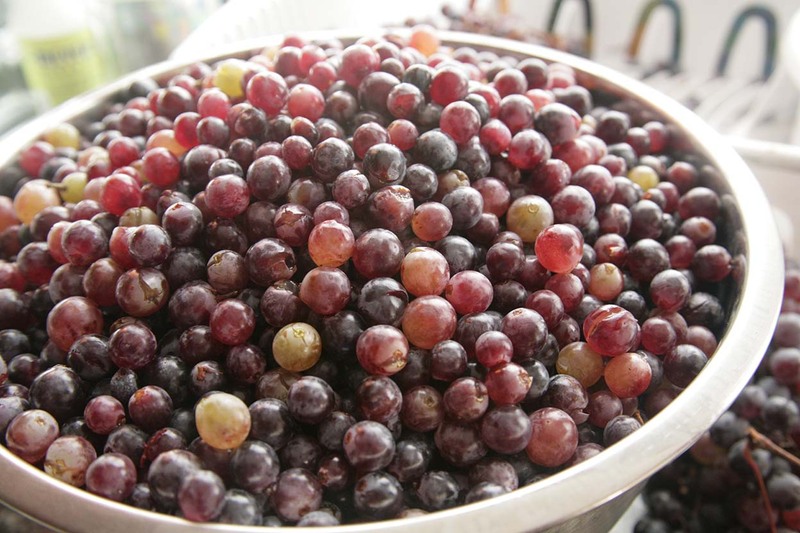 They boiled down into this plum-colored grape juice. Then, I strained out all the seeds and skins. Put it back in the pot and added sugar to taste. I like my jelly not too sweet, and I’m very bad at following directions. 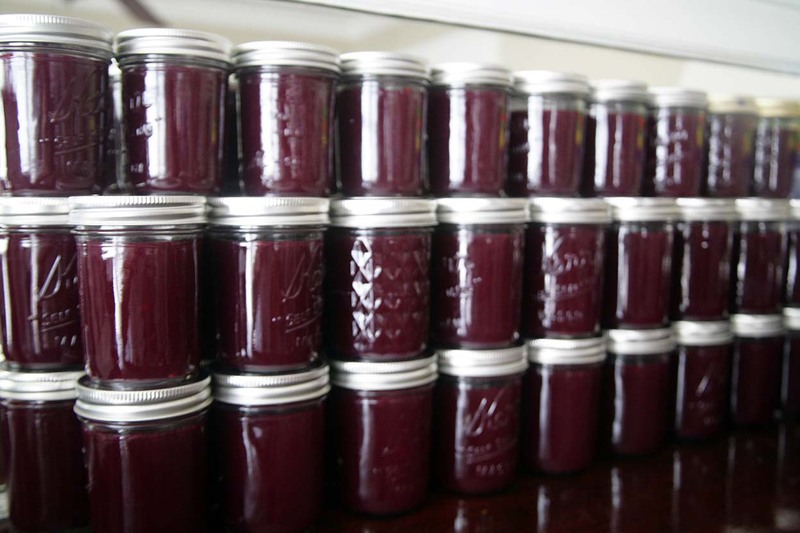 I ended up using one 4.7-ounce container of Ball brand pectin per pot. I might have been able to use less, but I was worried that the jelly wouldn’t set. It was like a factory in our house! And the house smelled delicious for days. 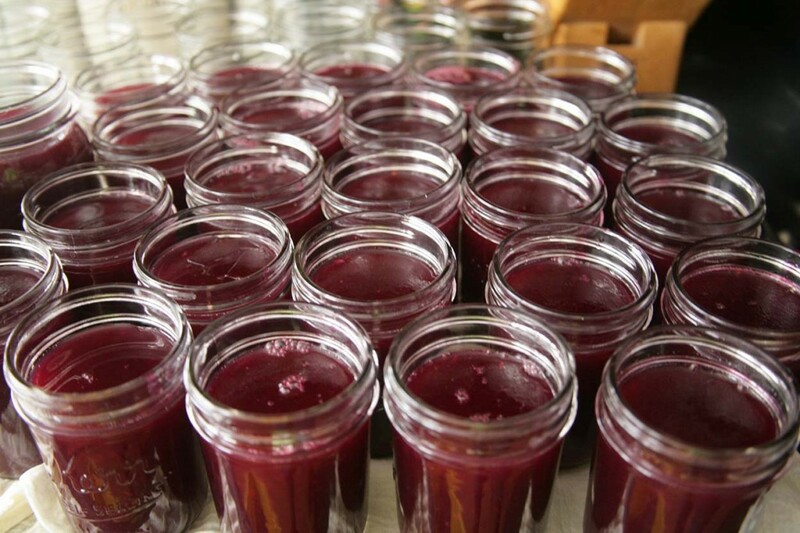 I ended up putting up over 50 half-pint jars! And over 6 giant bottles of juice. 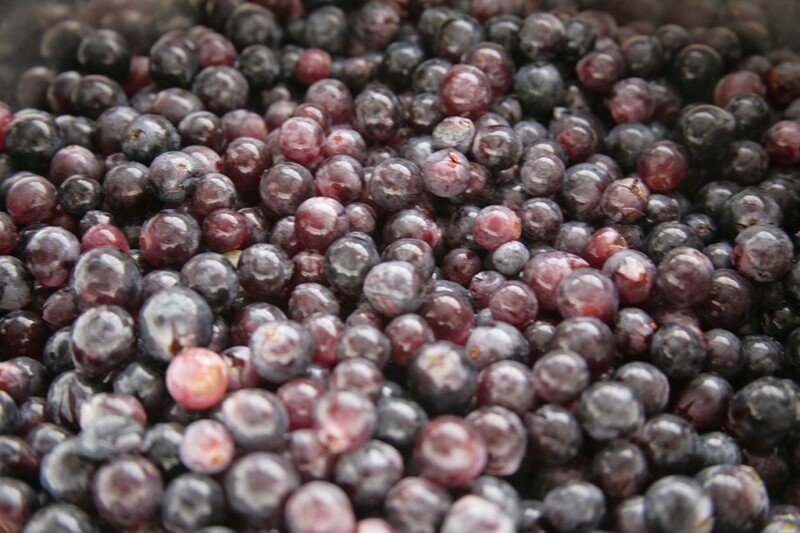 Our juicer was on its last legs, and juicing all those grapes was the final nail in the juicer’s coffin. over 50 jars canned and sealed! 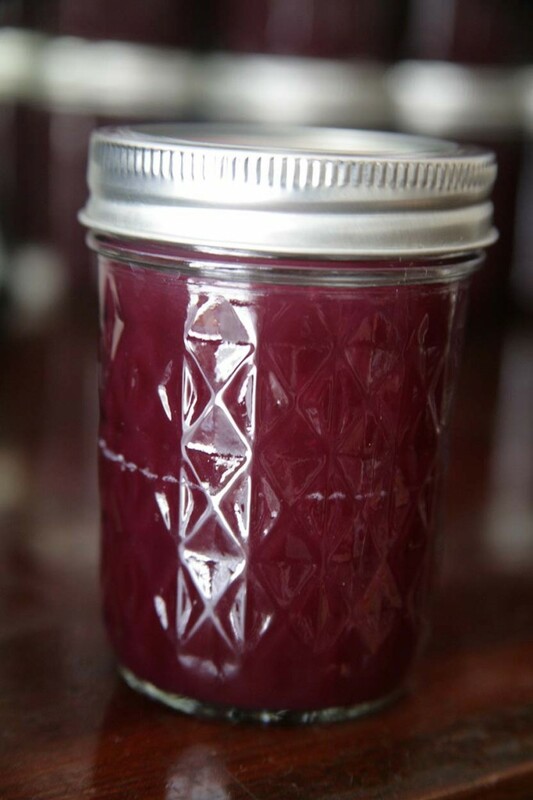 The jelly came out a gorgeous plum color with just a bit of tartness. Whew! This was the first year that my fig tree produced pounds and pounds of tarts. I had to find creative ways to use them and gave away giant basketfuls to friends and family. I made a little tart with a pate sucree crust, which is crisp like a buttery shortbread. This recipe makes 2 crusts. Freeze one for later. It’s perfect for all those ripe summer peaches at the farmer’s market. Be sure to thaw it overnight in the refrigerator or let sit until pliable. The dough is incredibly forgiving, so don’t fret if it tears when you roll it out. 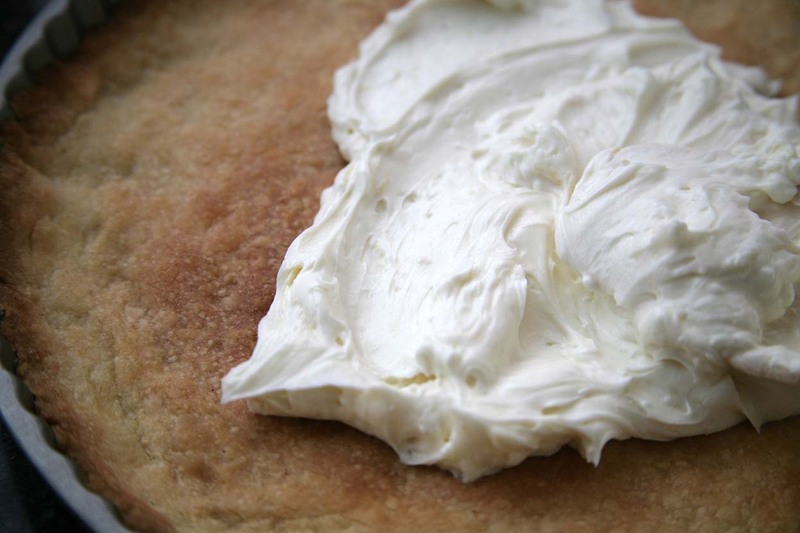 For the crust, cream together 1 cup (2 sticks) butter at room temperature and 1/3 cup sugar. Add 2-3/4 cups flour and mix until fully incorporated. Add the egg yolks and cream and continue to mix on low speed until the dough comes together, about 30 seconds. Wrap in plastic wrap and refrigerate for 2 hours (or up to 4 days). Divide into 2 and shape into 2 flat disks. Wrap in plastic wrap and refrigerate for 2 hours (or up to 4 days). Grease and flour your tart pan. Or use a convenient baking spray (that has flour in it). I used an 11-inch round tart pan, but any tart pan will do. Flour your work surface, dough and rolling pin well so the dough doesn’t stick. Roll out dough, starting in middle and rolling outward, to a 1/4″ thick round or rectangle, depending on your pan. Lift over the rolling pin and place in tart pan. Press dough into sides, corners and bottom. Patch holes or tears by pressing dough with fingers. Refrigerate 30 minutes. Bake at 350°F for 30 minutes until golden. Let cool before filling. Stem about 12 to 25 ripe figs (depending on the size of the figs and your pan). I had tiny figs, so I had to use many of them. Cut one fig into quarters, and cut the others in half. 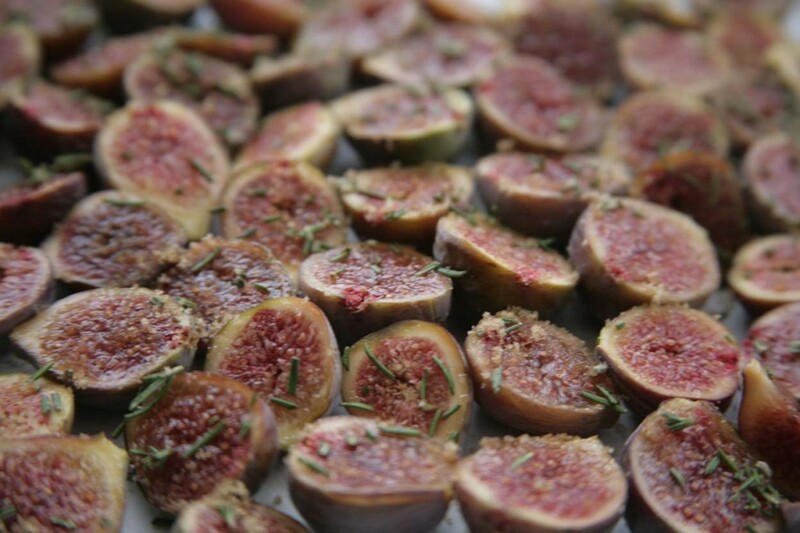 Place cut figs on a baking sheet lined with parchment paper. Sprinkle with a generous amount of brown sugar and chopped rosemary. Broil on high just until sugar has caramelized, checking to not burn, about 5-6 minutes. 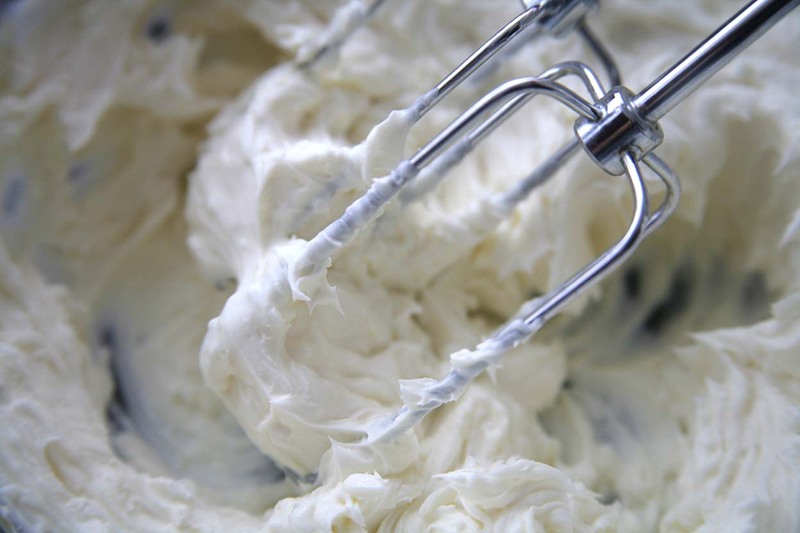 With a hand mixer, whip together two 8-ounce packages of marscapone and/or cream cheeses, vanilla, 1/8 cup honey, 1/3 cup sugar and lemon zest until creamy, scraping down sides as needed. Beat until smooth. I added zest from my Meyer lemon, but any lemon will do. Spread the cream cheese filling on the cooled tart shell. It doesn’t have to be perfect, because the figs will make it look pretty. You can use a butter knife or a silicon spatula. Whatever works for you. 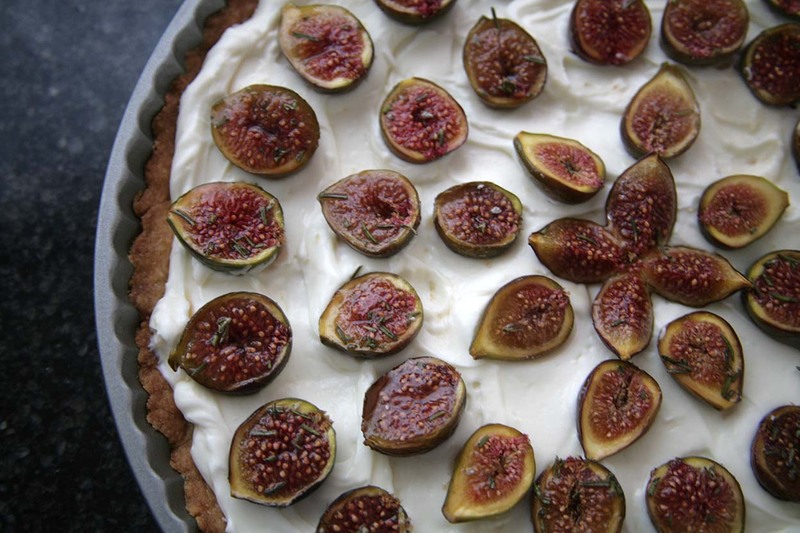 Fill cooled tart shell and top with figs. Place the quartered fig in the middle, and arrange the other figs around it. Refrigerate before serving. I like to make it in the morning before a dinner party. It’s a pretty looking dessert! It serves about 8 to 12 people. The rosemary adds a nice fragrance. For the crust: Cream the butter and sugar together until light and fluffy, stopping on occasion to scrape down the bowl as needed (about 3 minutes if using an electric mixer). Add the flour and salt and mix until fully incorporated (about one minute). Add the egg yolks and heavy cream and continue to mix until the dough comes together (about 30 seconds on low speed). Divide into 2 and shape into 2 flat disks. Wrap in plastic wrap and refrigerate for at least 2 hours (or up to 4 days). 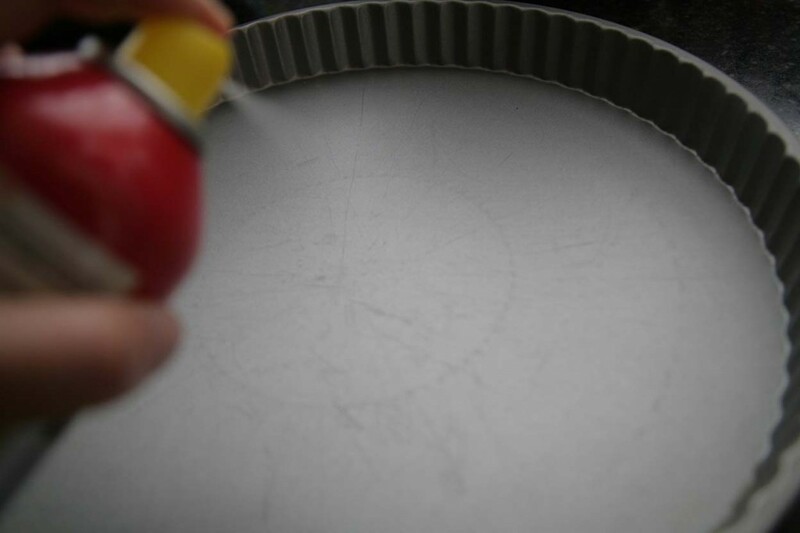 Spray your tart pan with a baking spray or grease and flour your pan. I used an 11-inch round tart pan, but any tart pan will do. Flour your work surface, dough and rolling pin well so the dough doesn’t stick. 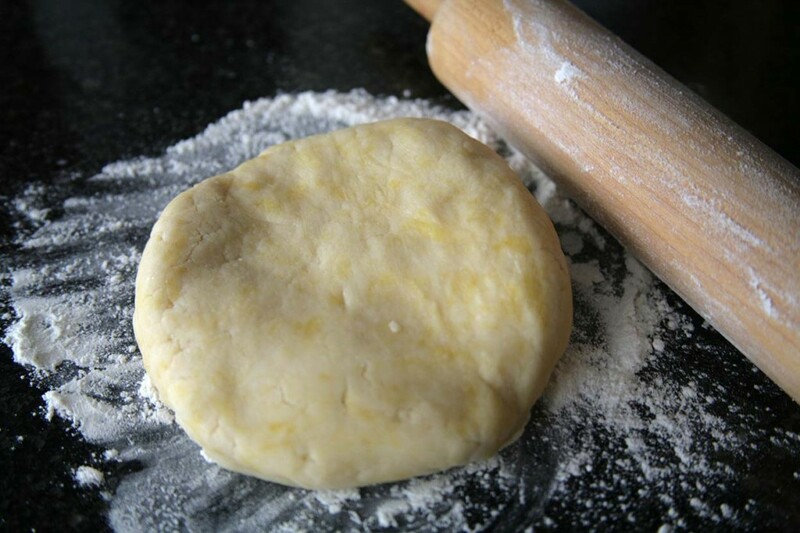 Roll out dough, starting in middle and rolling outward, to a 1/4″ thick round or rectangle, depending on your pan. Cut one fig into quarters, and cut the others in half. 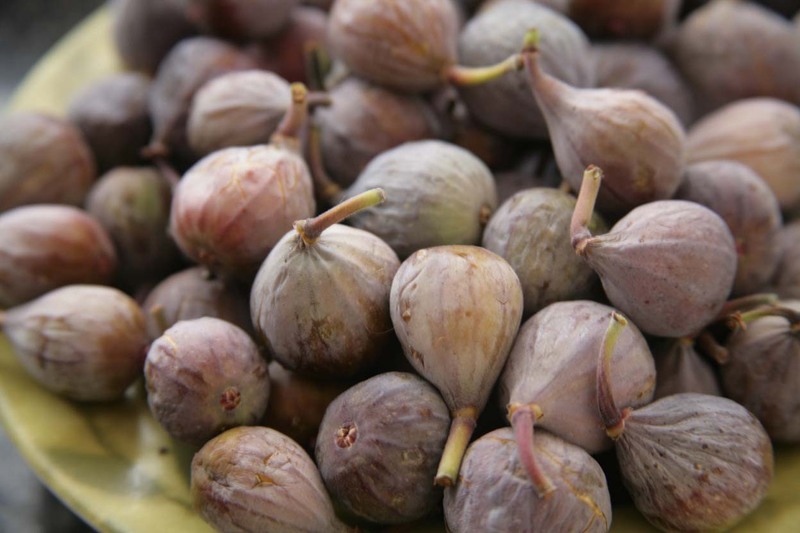 Place cut figs on a baking sheet lined with parchment paper. Sprinkle with a generous amount of brown sugar and the chopped rosemary. Broil just until sugar has caramelized, checking to not burn, about 5 to 6 minutes. 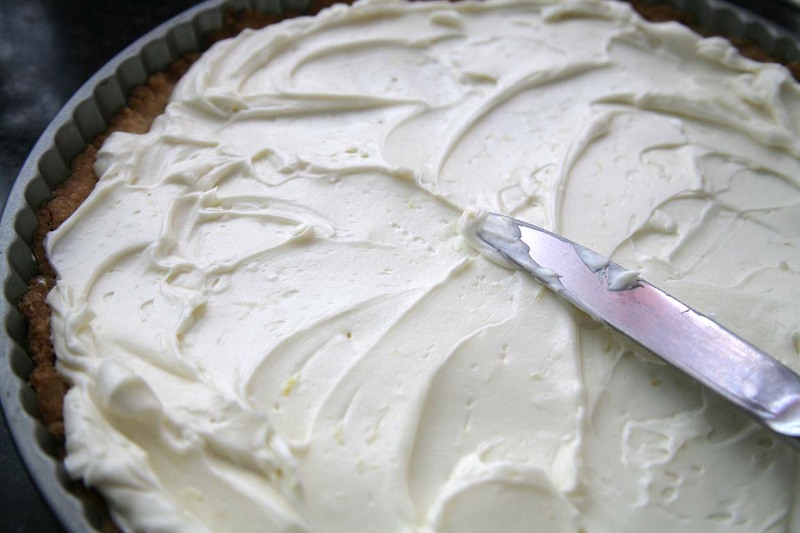 With a hand mixer, whip cheeses, vanilla, honey, sugar and lemon zest until creamy, scraping down sides. Beat until smooth. 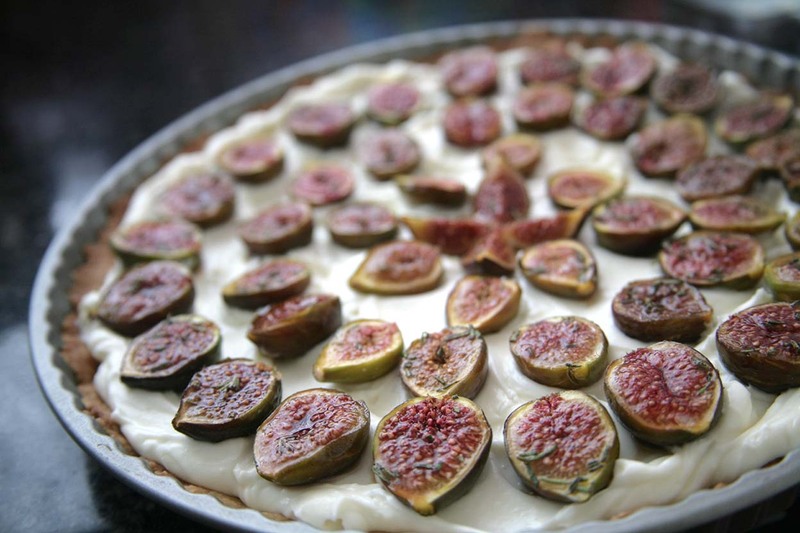 Fill cooled tart shell and top with figs. Place the quartered fig in the middle, and arrange the other figs around it. Refrigerate before serving. Makes one tart, enough for 8 to 12 people.